clean&simple: Quick Card and another pdf! Wow thanks I love these pdf links. Your sketches are wonderful. Thank you SOOOOOO much for the PDF! It's the first time I"ve seen this; it'll be so great to have this printout at my scrap table; I appreciate all your hard work! Thanks for the pdf :) and love the card. Cheers to you! WOW, so bright & cheerful! I keep coming back to this card, as I cant stay away from the clean & simple combo; "thanks so much" for sharing this unusual combo! Great card in lovely colors. Thankyou for compiling the sketches and sharing. Finding your blog very inspirational. You are so talented and I am so blessed by you sharing of your talent. You are a marvel Natasha - thanks for the pdfs! Love the card - the gradient drinks are very effective. Thank you so much for putting all the FTL in one place. I keep them with me at all times for wonderful inspiration. 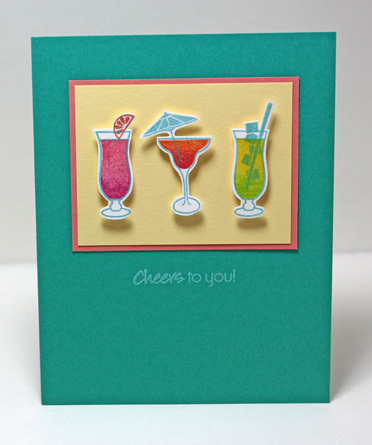 What a fun, summery card. I love the shading in the drinks. So simple, yet so stunning. Thanks so much for the PDF's. Having the FTL in one central place is such a handy timesaver. Love this! It so says SUMMER! Thanks so much for the pdfs! I found this blog a few weeks ago and now can have ALL the layouts in one document (I combined each of the pdfs into one file) thanks to someone's hard work!! I really have enjoyed the layouts and will enjoy looking through previous layouts and incorporating them into my card designs. Thank you so very much for the PDF's I love the sketches and my PC is not in my stamping area so this is great for me!!! Thank you! Thanks so much for making the PDFs! My computer is across the room from my stamping desk, so these summaries will be very helpful. I finally got them all printed tonight so maybe now I can crank out some cards. Thanks again!